KAPA Guitars was founded in 1963 by a Dutch immigrant named Koob Veneman. Mr. Veneman was the owner of Veneman's Music Emporium, a musical instrument store in Silver Spring Maryland. During the early 1960’s Veneman made the decision to build his own unique line of guitars. This was the years of the British Invasion and the Guitar Boom and Mr. Veneman wanted his piece of the pie. Many of the guitars in stock at the Veneman store consisted of guitars that were imported from Germany and Italy. The connections with these companies provided him with an excellent oportunity to purchase supplies from overseas manufacturers. His plan was to order guitar parts from European suppliers, assemble them in Edsmonston Maryland where the guitars bodies were created. The necks, pickups and electronics originally came from German manufacturer Hofner. 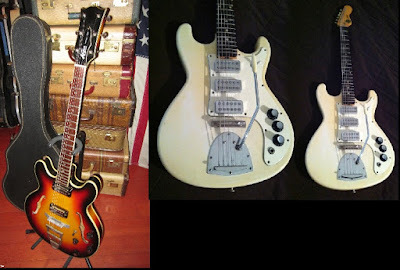 The guitars generally were equipped with two slider switches to control on/off function of the pickups, which is typical of Hofner's design of the 1960’s. 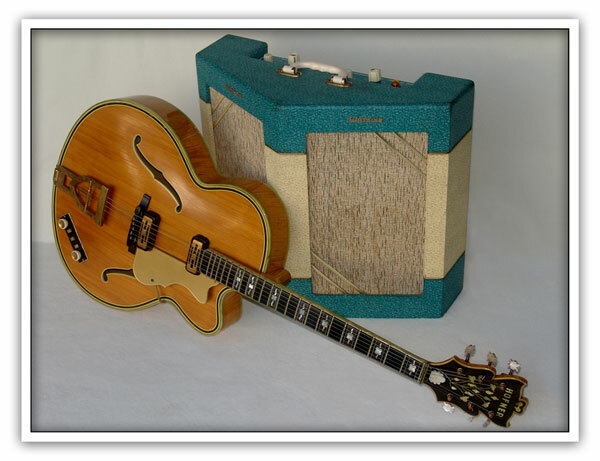 In the company's later years they made their own pickups, which looked similar to Hofner units. The tuners were made by Schaller. Kapa made his own bridges and tremolo assemblies. Most KAPA guitars are equipped with the tremolo. Veneman named the company after himself, wife and children by using an anagram of their first names. Of course his name is Koob, his son’s name, Albert, his daughters name, Patricia and his wife’s name Adeline. 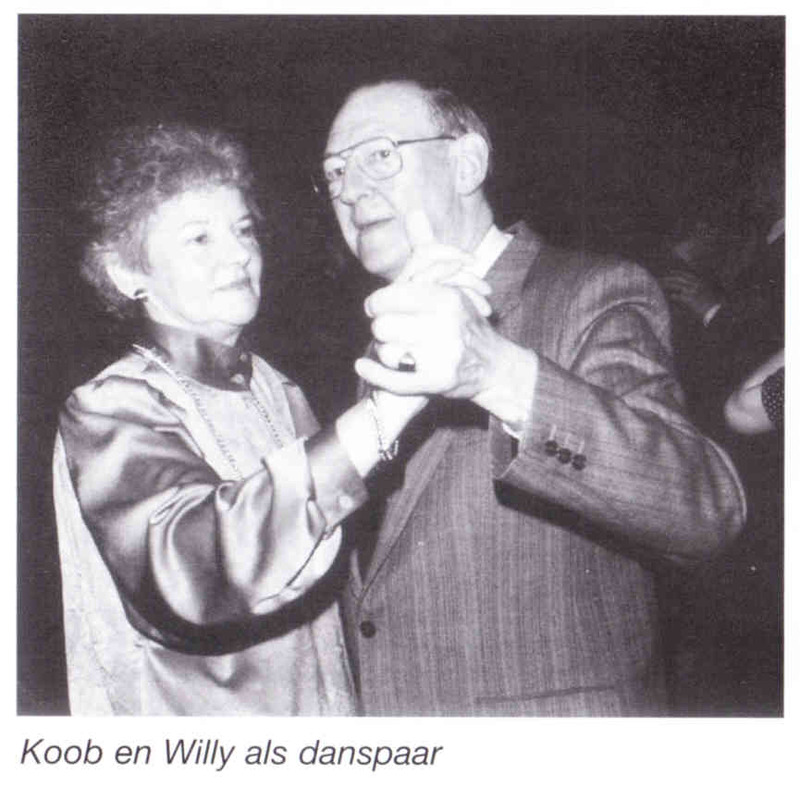 Later Koob’s brother joined the family business. KAPA necks are ultra thin, which is sort of a ’60 thing. Guitarists wanted to play fast and for some odd reason, manufacturers equated this with skinny necks instead of low action. In fact, Gibson ES-335’s of this era had thin necks. The bodies also were thin in comparison to Fender and Gibson bodies. KAPA was able to sell it's instruments at a price well below the competitors. It was rumored that Fender filed a lawsuit against Kapa in the 1960's, although I cannot seen to find anything to verify a suit. If anyone knows about this, email me. It is interesting that KAPA 12 string guitars came out around the same time that Fender released the Fender XII. The cost of the KAPA was almost half of the Fender instrument. To the unfamiliar, one could mistake a KAPA for a Fender guitar, based on it's Jaguar and Stratocaster-like shapes and the shape of the headstock. The KAPA logo used script on the headstock was very similar to what we call the Fender Spaghetti script. However the KAPA logo had a circle with a crest in the middle that was similar to the Veneman family crest. KAPA guitars were founded on some great principals set up by the Venemans. The instruments were well made, playable and affordable. Plus they were made in the USA. The guitar boom eventually wound down. Competition was fierce. And Asian made instruments were getting better all the time. During the companies final years some of the production was outsourced to Japan, no doubt due to the high cost of labor. Finally in 1970 KAPA ceased production and sold it's assets to Mosrite and Microfret Guitar Companies. 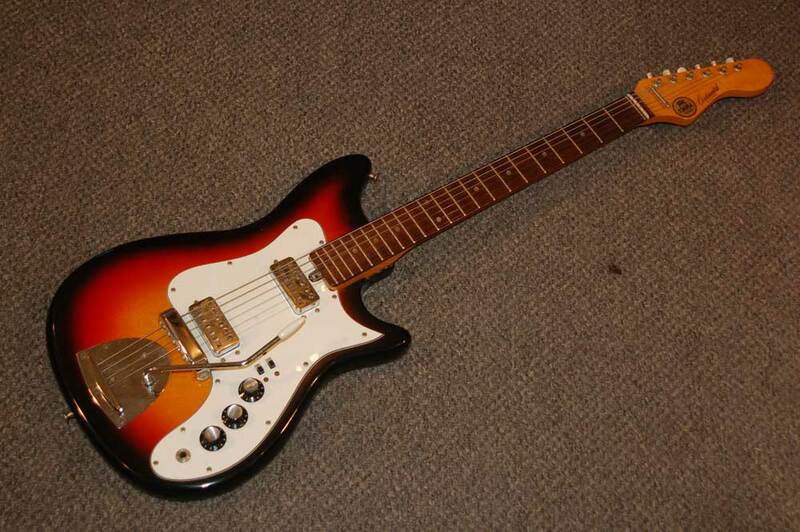 Mosrite also outsourced the KAPA instruments production to Japan. 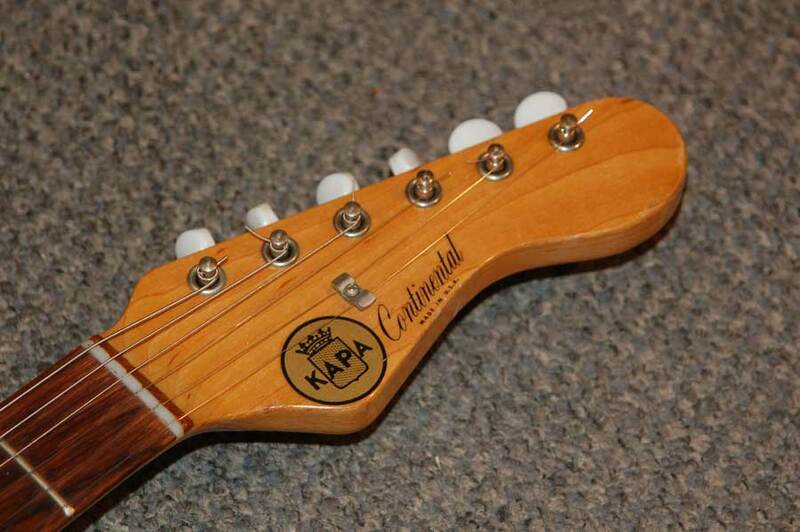 One of the earliest models produced by KAPA was called The Challenger which had a Strat-like body. In 1966 the name was changed to The Continental, which had a slightly different shape. The Cobra was a slightly smaller instrument with just one pickup. 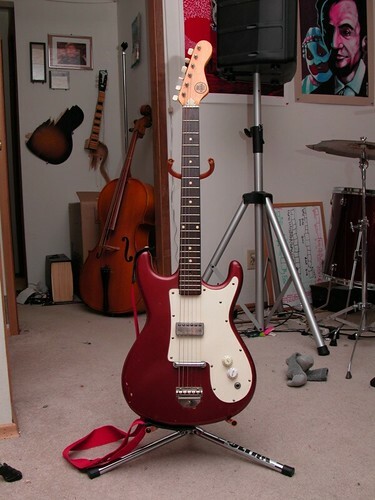 The Wildcat was another instrument that slightly resembled a Stratocaster and it had three pickups. One of the more well known KAPA guitars was called The Minstrel. 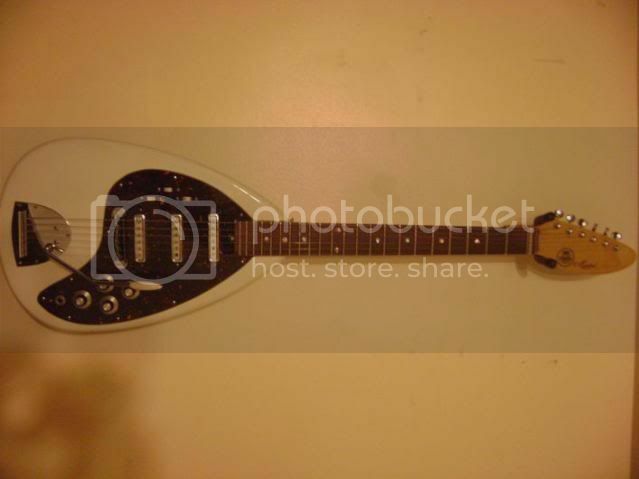 This was a 12 string guitar that had a tear drop shaped body sort of resembling an electric lute. 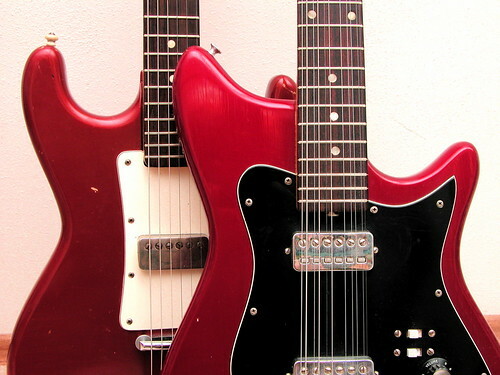 These instruments were also being produced during the same time Vox was selling guitars and the Vox Teardrop was one of their most popular models. KAPA also made a hollow body model called the 506. It resembled a Gibson ES-335. The headstock on this guitar was three-on-a-side. The KAPA script was engraved, instead of being placed as a decal. The metal trapeze tailpiece was also engraved with the KAPA name and was similar to one Hofner used on their guitars. This guitar was built in Japan with German parts. There were other guitars in the KAPA 500 series, all were made in Japan. KAPA guitars are still available through collectors and sellers. If set up properly they are nice and affordable players. It is also wonderful that KAPA guitars were a product of the United States. I have recently learned of the passing of Koob Veneman. May God bless him and his family. He left his mark in the history as a luthier and enteprenuer. First of all thank you for visiting the blog. I appreciate it. I beg your pardon for the use of the photos. They have been removed. I checked out other photos on google under your websites name and I have to say you have an excellent collection of nice old instruments. Thank you also for the comments about the Norlin v Hoshino/Elger/Ibanez lawsuit. I think Vintage Guitar magazine did a piece about that last year. It's funny how everyone attaches lawsuit model to a guitar they want to sell. Actually, while Veneman's was in Hyattsville, the guitars were built at a plant on 46th Avenue in the town of Edmonston, Maryland. I was raised on 49th ave, in Edmonston and remember the place very well. In fact, as kids, we used to dig through the Kapa guitar factory dumpsters and bring home pieces of the refuge. One of the things we always brought home were pieces of the plastic laminated pick guards we found. We would heat these black and white pieces, distort them, and then sand them until we had a bunch of marble-looking guitar picks. I spent almost every Saturday afternoon at the Veneman's store near Wheaton Plaza (and then Rockville) in the mid/late 70s. I just purchased a beater single pickup Continental off E-bay. Tuners were all messed up. Just finished putting on new ones. My parents bought a KAPA guitar for my brother when we are still young. The design is really nice. We'd spent Saturday afternoons playing inspirational music. I truly enjoy reading your posts. Thanks. An addition to my previous post: After forwarding this blog to my older brother, we spoke on the phone- he still lives in the Hyattsville area of Maryland. He reminded me of a bass guitar that a friend of ours had built out of the parts recovered from the KAPA factory dumpster. "O'Dad", as the fellow was known, put that base together "just to see if it would work" and, surprisingly, it did. The funny thing is, it was unpainted and stayed that way for an awfully long time, solely because O'Dad dreaded having to dis-assemble and re-assemble it to add paint. When he finally did paint it, it was done via spray cans in an approximation of the Camaro Blue that was so popular in the late '60's. Boy, does this site bring back memories. We used to rent a Kapa Continental and a Kapa Bass for $7 per month each back in the 1960's. Heck, we couldn't afford to buy anything but always scrapped up the rental money somehow. I have always remembered doing business with the Veneman's in their store on Georgia Avenue. Glad to hear others remember the family and their role in a lot of people's love for music. I'm a guitarist. the original purpose of the resonator was to produce a very loud sound; this purpose has been largely superseded by electrical amplification. I got a Kapa Continental 17 yrs ago as my first guitar. I have since purchased and sold several other guitars, but have hung onto this one through the years. The neck and action on this make it easy and comfortable to play and it has a nice rounded sound. This is definitely a great guitar! You write that the challenger was available a 12 string model, but my father and now my nephew owns a continental 12 string mnodel. I own a Kapa 12 string electric guitar and it is the easiest to play and a great sounding guitar.It compares to a Rickenbacker 12 string because it is well made in the USA. Would like some information on the Kapa model A732 Acoustic guitar. What wood is it made of and were these good guitars? If anyone has info on dimensions as well as nut width that would be helpful. I am 74 years of age and just learning guitar and will try to get this guitar on eBay if it is a worthwhile investment. Looking for something that is playable with good tone and intonation. Realize this is a used one but what it was new goes a long way to tell me what it may still he. Thanks for any assistance one can give me in this regard. I remember the original Veneman's store being in Silver Spring on Georgia Avenue near Bonifant St. My Dad bought me a Kapa Frontier acoustic dreadnaught for $50. They had a sale of about 15 acoustic dread guitars all of which had various cosmetic and structural problems. All of these acoutics were made in Japan and looked like a Guild D-50. The pickguard had fallen off of mine, but other than that, it was in great shape. It was made around 1965-66. I still have the guitar and it sounds and plays great. My son has adopted the Frontier and it is his favorite. I purchased my continental.dual pickup 12 string in 1965/66 with a hardshell case I want to say I paid 3~400. A wonderful guitar with a slim neck. I have had this in storage since 1975. Recently looked at it and it still looks good the white color has yellowed. I would like to find a good person to go over it and bring it back to life. When in my middle teens (late 1970's) my mother sang in several country-westen bar bands using a blood-red Challenger. I more-or-less stole that guitar from her when she upgraded to a more appropriate elec/acoustic. Once in my teenage grip, I stripped the paint and decals off of it since most of it was chipping off anyway, and clear-laquered it. Still have it, still love it. Low action and I love the round neck. Like a baseball bat split down the middle. Never liked the pick-ups though. I plan on upgrading them as well as new switches, pots, wiring and frets to return it to dependable playability. Thirty-five years later I've traded and sold and given away many guitars over the years, but I never could part with this one, and I'm very glad for that. Great site. I just bought a Challenger hollow body 506 to compliment my 1964 Continental. Does anyone know why the picturer of the 506 on this site shows a head stock that resembles a Gibson, while the head stock on my 506 looks like the standard KAPA> Is there a chance the neck was swapped out at one time, or did they manufacture a 506 with this type of head stock? Thanks. I was amazed to find there was as site regarding KAPA guitars because I worked at the factory in 1965 to 1967. I worked as an assembler on the finished product line putting together the various parts of the guitar from the body to the neck to the electronics. As far as I can remember, almost all of the materials that we used were created and crafted in the factory from the raw wood to the finished bodies to the paint shop to the electronics assembly to all of the products in the neck, the frets - everything was all handmade there. I always enjoyed walking around the factory when I wasn't too busy on the assembly line to watch the various stations making the parts for the guitars. It was a very busy factory. We never had any real down time, we were constantly working, producing the guitars as fast as we could. I remember Mr. Veneman because he interviewed and hired me and always treated the employees like they were part of the extended family. I remember him bringing his two children to the factory and him showing them around and introducing them to the employees. Everyone who worked at the factory was quite capable of the position that Mr. Veneman had given them in the guitar-making process of producing a quality guitar. I especially remember the one and only painter who did such a spectacular job of bringing the raw wood to its finished beautiful state. I remember on occasion when my drill would slip while installing the face plate putting a dent into the beautiful paint job which I would then have to return to the painter to have him touch it up. He never got mad at me, just gave me a great big grin and laughed. But I secretly think that he quite often thought I did it on purpose so I could come back and watch him laugh. He was happy all the time. I asked him why he was happy all the time and he said, "Man, I just love painting these guitars." And he was good at it. I've always had fond memories of working at KAPA guitar, and I'm wondering if any of the other employees from the factory during that time period are still around. I'd love to hear from you. My dad bought me my first guitar from Veneman's back in the mid-60s. It was a red Kapa Cobra. I later sold it to a friend and bought a black Kapa Minstrel. Continued to patronize Veneman's and bought a Gibson SG Standard there in the spring of 1969. I still have a Kapa Guitar catalog/brochure from when my Cobra was purchased at Veneman's. I guess I'm a packrat. Wish I still had the Kapas (the SG is safe and sound with me at least). Thanks so much for the site. I had no idea of the background of the Continental that my Dad bought for me back in the '60 from T Ross Music in Struthers, Ohio. Recently, my son (7 yrs old) made me dig it our of storage so he could play it, and now we both are enjoying it again. I have a Kapa 500 series good condition how much is it worth? my first bass was a continental purchased new spring of 1966. red with white pick guard. i felt it sounded better than the mustang. i had it until the summer of 1971 when i purchased a fender fretless. the kapa basses played GREAT! First of all, thanks for such a fascinating blog. It is surprisingly difficult to find reliable information on KAPA guitars. I love KAPA guitars. In THEE DIRTYBEATS, I used a '67 KAPA Minstrel (see pic at link) to recreate the sound of aggressive mid-60s garage rock. The Minstrel's a strange beast: with an American-made body, neck by Hofner, electronics and pickups by Harmony, it has this thin, trebly tone, much like an old Rick. Clean, with all three pickups engaged, the Minstrel is pleasingly lush, very reminiscent of the vintage Mercy sound; overdriven, it screams, squeals, and is prone to uncontrollable fits. I suspect this is due to the dicey pickups. It's an unpredictable instrument; but if you are into that vintage garage rock thing, that is arguably part of the charm. I used the Minstrel for all my solos on the debut ep, as it contrasts so well with (i.e. it cuts through) Jamie's thick fuzzed-out Mosrite -- another guitar with an especially good tone for garage. I have a Kappa guitar that I purchased back in 1968 when I was 17 from a guy that was panhandling from New York back to the Grand Ole Opry and needed money for bus fair he said he was a studio musician and by the way he played it sure sounded it. he said the Kappa Continental 12 string he had was a 1967 model. so, I offered him 40 dollars and told me to take good care of it. I have. The wood has aged and I compare it to the sound of my 1964 Gibson Les Paul std. or my 1969 Fender Strat. SCOBIE AKA LINKWRAY BAND Laurel, Md. I bought a blue Kapa Minstrel in I'd say '65 for $40 from Oliver's Music in Mystic CT. It was in the window starting at "x" and went down $5 every day -I'd ride by in the schoolbus, until it was $40 and I popped for it. I still have it in the case - dis-assembled, was going to paint it decades ago, glad I didn't. The wood on body is funny - kind of pasty and pitted in places - as if not real wood - neck is pristine. I wonder what it's worth?? I haven't seen any info on my KAPA acoustic 12 string. Its been with me for about 40 years or so. Just strung it up with a new set of strings. It has really mellowed over the years. I'd like to sell it as I'm getting on in years now. Don't know what to ask. Any advice would be appreciated. My neighbor Gave me an old guitar one time.. he didn't have any info, just said he wanted to give it to me.. turns out, it was a kapa continental 12 string electric, with a natural wood body and white pickup.. solid tail piece.. I've kept it in my possession for 20 years now.. still in it's original case. I always wondered, but never could find info on this guitar company.. thanks for all the info. I know what I have now!! I've got a 1965 Kapa Cora in pretty much original shape. Decals all nearly perfect, nice straight neck, and the electrics artwork fine. I've owned it about 20 years or so, and wouldn't dream of selling it. My son is pretty good player, and plays it at least as much as his Tele. All it needs to be complete is the tailpiece cover. No tremolo bar on this one..
My first guitar was a Kapa Continental that had been abused quite a bit, but it was/is a great player. Still have it 15 years later. I think I paid $25 for it? It took me years to discover what it was as it had been painted, and all the labels removed. I still love the guitar, and plan on restoring it to be a daily player soon. Thanks for the site. Also, if anyone has information on who owns the rights to the Kapa company I would appreciate an email. Ripley1046(at)Yahoo(dot)com. Just a minor technical detail, but in Paragraph 5 you have mis-spelled the town of Edmonston. Were I not from that little one-square-mile town, it wouldn't matter much to me. But I spent the first 17 years of my life there and am rather proud of it. I was fortunate to recently acquire a KAPA Es 335 type off of ebay. After getting it set up properly, it plays like a dream. This old guitar has excellent sustain and is one of my most treasured guitars. my grandfather gave me one of his guitars a few weeks ago and i've been cleaning and restingingit etc. its a blue KAPA hollow body 12 string chalenger with double cut outs, raised pick gaurd, the whole deal. and i was wondering how much a guitar like this might be worth. everything is origenal except the pick ups which look to be have been changed some where down the line. they are both humbuckers which is what the guitar origenaly came with but i cant tell who makes this set thats on it now. and info would be much apreciated. HI. I purchased a '66-67 (based on pot codes)KAPA Continental a few months ago. It has 2 "Pix" pick-ups (back of pick-ups have "Erlangen-Pix" and "Germany" stamped into the metal) also used by Hofner. The bottom of the adjustable bridge is stamped "Germany". As a kid, I loved all things guitar (esp. electric). I still do. In the fifth grade, it seemed as if every guy received an electric guitar for Christmas. I received an acoustic guitar from the Sears catalog (which I still own and cherish)but, it wasn't electric. A few kids received Silvertone 1448's or 1457's (Amp-in Case). I still love those old "Dano" guitars. A couple of guys received "Kays" with separate amps. Soon after, all of the guys were allowed to bring their rigs to school. One guy brought an electric guitar I was totally unfamiliar with. While I own a newer Gibson Les Paul, a Fender Telecaster and a couple of nice acoustics, I am drawn to those cool guitars of the 60's that most parents could afford. In the 60's, if it was an electric guitar, it had to be cool (Fender and Gibson were irrelevant, at the time). I've since purchased a 1448 and 1457 (with Amp-in-Case), a few Kays, Harmonys and Alamos. I've picked up a few "entry-level" Fenders and Gibsons from the era (Music Master, Duo-Sonic, Melody Maker). But, when I discovered KAPA on Ebay,, I immediately recognized the burgundy-red KAPA Continental as the "unknown" guitar my classmate brought to school back in the day. It was obviously "fancier" (it was more upscale than Silvertones or Kays) than the others, esp. with that cool tremolo and sliding switches. And, I immediately recognized that round KAPA decal. At my age, I assumed I knew every electric guitar that came out of the USA back then. It is still a very cool guitar, with excellent action and sound. Like many KAPA's, the paint job wasn't the greatest but, it still looks great. That zero-fret (and retaining bar)allows for very, very low action. That, combined with the ultra-thin neck allows me to fret notes with very light touch. While I love to play guitar, I am strictly an amateur who loves to gig with friends. While all of the other guitars have their uses, the Continental has really been a pleasant surprise. Not a single "guitar-loving" friend had heard of KAPA guitars. Now, they all want one. Whatever the reason for the very distinctive sound of my Continental (pick-ups, neck, body, combination, whatever),it has a sound that is very unique (in a good way). It is the one electric in my small arsenal that can be immediately recognized via its distinctive sound (regardless of the pick-up setting, tone or volume). It's great to read stories about these "unknown" KAPA guitars. Hey, I have a KAPA Continental 12-string that was given to me by a friend who he received from his older uncle. I know they released the 12-string in '66...please correct me if I am wrong... but I am wanting to know what year it is. It is is nice shape. still plays very well with a Tri-Burst finish. Three knobs and two switches. No tremolo bar though. It has to be between 66-70 I was assuming. It has no number on the back steel plate. Is there any way to find the year and/or value of this guitar. I could never sell, but I would like to know. It is exactly like this...https://reverb.com/item/535245-vintage-1960s-kapa-continental-12-string-usa. Thanks for any info....Thanks-Jeremy. Great Blog! Quick question... I saw this post on Craigslist and I was wondering if you thought this is a fair price. I love the look of the guitar! Thanks... Any info is appreciated.. 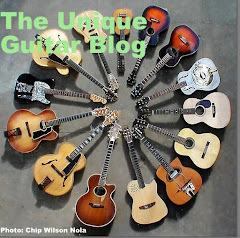 I just found this site.. Nice to see other's also have KAPA guitars. I have 2 KAPA's. One is an Orange Continental I bought in 1965. I've never seen another Orange one. Maybe it was a special order. The other is a white Challenger I got in 1968. I bought them in the silver Spring store and I still have both of them. Any other KAPA owners here in Maryland? ha thats my minstrel in the photo. I have recently bought my second Challenger and my 3rd. KAPA guitar. This one has the Tortoise pickguard instead of white but it's been repainted and the Decal sanded off like usual. I found a Decal maker on EBAY that made me some KILLER looking KAPA decals with the Challenger script and made in USA like the original decals. He works super cheap but super slow also. Only like $12.00 for 2 each KAPA and he did me like 4 White and 4 Silver Ibanez script decals. Just ask and I can send you a link to the guy. He's in like Argentina but his work is Flawless! Do you happen to know of how to find out what year my model was made? Also, any idea where to get parts for it? I'd love to completely restore mine, and I need the bridge, knobs, and a way to get the logo back on the headstock. Anyone have any idea for a bridge with intonation adjustments that will cross over to fit a kapa. The posts are 65mm apart.....I used a harmony curved bar bridge but there's no intonation adjustment on it. The harmony bridge does work by the way (I had to just run a drill in one of the post holes to open up the post hole a sliver...probably .25 of a mm).....I think it's 12" radius and the kapa is about 9.5 but it works and will get it playing. How can I find out how much my kappa 12 string hollow body is worth? I bought a Kapa Minstral (teardrop shape with 3 pick-ups)brand new back in the mid 60s at a music store in Farmingdale, New York and still have it today. It was my 1st guitar and although it has acquired a few bumps and bruises over the years and the white finish has yellowed, the neck plays as great as ever and it still sounds amazing. It is my favorite out of the 15 guitars I own. When I sat down to play Mr Veneman told my father I was playing upside down and backwards and should never play that way. After crying lol - I bought the guitar and my father immediately signed me up with a well known local musician by the name of Jack Rakestraw to teach me how to play right handed and with the guitar stringed the right way. After 2 lessons I quit and was adamant about teaching myself ( old habits never die)! Anyway, have that guitar to this day, it is in perfect shape and I am very sentimental about it. Thanks Dad and thank u Mr. Veneman! Recently rescued a Kapa continental. All original. 50yrs of smoke damage. Guessing 66. Cleaned up well. Plays great sounds good. Will find a good home. Thanks for the great info.